On Saturday I ranted furiously against the Senate for its arrant failure to even bring climate legislation to the floor. Grist has a telling article on why the failure occurred. I'll write more on the abomination that is the United States Senate in the coming weeks. But lest I hurl myself and others into an endless spiral of pessimism and cynicism, let's talk for a minute about what hope there is left for potentially doing something about climate change mitigation. The key word here: EPA. No one wanted it to happen. No one thought it was a good idea to regulate greenhouse gas emissions under the Clean Air Act. It was leverage. It was a way to say to the Senate, "Get your act together, or we'll do this the bad way." Maybe the Senate called the Executive's bluff. Or maybe the Senate is just a largely worthless, undemocratic institution. But either way, they didn't come up with anything, so Clean Air Act it is. In February, EPA laid out its timetable for action, and by May it had determined its thresholds. It's no surprise that it actually took a much more conservative approach to carbon regulation than originally expected; by that point, it was already highly probably that the Senate would not act. EPA’s phased-in approach will start in January 2011, when Clean Air Act permitting requirements for GHGs will kick in for large facilities that are already obtaining Clean Air Act permits for other pollutants. Those facilities will be required to include GHGs in their permit if they increase these emissions by at least 75,000 tons per year (tpy). Under the new emissions thresholds for GHGs that begin in July 2011, EPA estimates approximately 900 additional permitting actions covering new sources and modifications to existing sources would be subject to review each year. In addition, 550 sources will need to obtain operating permits for the first time because of their GHG emissions [emphasis mine]. Considering there are about 5,400 power plants in the U.S.—and many of the 900 additional and 550 new permits will be large industrial emitters—the threshold EPA has devised is really not nearly as big a deal as it could be. Still, we've seen ardent opposition from all Republicans (alongside ardent opposition to an alternative). And some Democrats are now leading the charge to postpone EPA's authority by at least two years, most notably Senator Jay Rockefeller (D-WV). The only hope against those measures—which will likely win out in the Senate (they're really good at not doing anything, but also stopping anything from happening)—is a presidential veto. Thankfully, this is a probability, at least with Obama still in office. The President and his team are still giving lip service to the desire for a stronger clean energy package, even one with a carbon cap. Gibbs says they're open to the possibility of adding such language to a conference bill between the House and Senate. 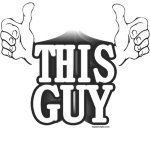 Who's got two thumbs and knows that's never going to happen? This guy.